More information about the An Insult-A-Day 2013 Desk Calendar. An Insult-A-Day Desk Calendar: Whoever said, "Sticks and stones will break my bones, but words will never hurt me," had never seen this calendar. 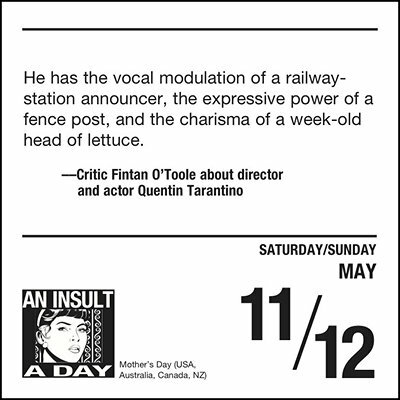 An Insult-a-Day 2013 Calendar showcases a hilarious collection of malicious and catty quotes taken straight from the mouths of well-known entertainers, authors, politicians, and other public figures. Whether shocking, offensive, or just downright funny, these insults guarantee that the speaker gets the last word. UPC: 050837292697 EAN: 9781449415761"